Year 2011 has just passed and many prefer to leave the history of grief, the same goes for online shopping sites in the world especially if it was not amazon. Since Year 2011 recorded sales of products through the Amazon Kindle 4 million which when compared to the year 2010 the only record 1 million. This achievement is caused by the efforts to improve these features are approximately 150 Kindle application Kindle is an amalgamation of series 2 series 3 and series 4 (for children). Kindle virtues presented in many different forums as a superior product with the ability to present information quickly without in our busy with lots of books. 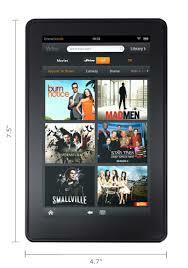 Some features of education has also been added to the Kindle product is so very good for your children. Not to forget some games like sudoku application has an additional package in the Kindle application. Some features require an application to run it in advance through the download process sehiinga require you to log on to amazon.com. In general, Kindle the fire provides a "myriad" content or services that can be enjoyed by users Kindle a fire, such as 1 million e-books (Kindle Store), 17 million songs (Amazon MP3 Store), hundreds of thousands of movies, popular TV Conten 10 thousand, and of course just games But behind all the advantages Kindle Fire, this product has some limitations from the viewpoint of a particular user. These tablets only provide WiFi connectivity (no 3G option), only 8 GB of internal memory, without a camera and microphone, and there is no Bluetooth connection, maps, GPS, and Micro SD slot. Special limited storage that Amazon has actually been anticipated by providing a free service its Cloud Storage (for content purchased from Amazon). For the year 2012 this is hard work for the developer Kindle in overcoming these problems.